Because our primary relationship to fruit is as a consumer, we are usually too immersed in the joyful act of eating fruit to take notice that it is by definition "the ripened ovary - together with the seeds - from one or more flowers of a plant." The differences between species are obvious, of course: fruit-ovaries disperse their seeds by being eaten, and then excreted by animals, whereas human-ovaries, remaining intact within the body, disperse their "seeds" (eggs) by way of the fallopian tubes. Observing a cross-section of the pomegranate and the human ovary, side-by-side, you can see the remarkable resemblance. The ancient 'doctrine of signatures' that Nature weaves into herself, and which is recognized by many systems of traditional medicine around the world, makes it so that sometimes the edible portion of a plant (food) will be of unique benefit to the organ in the body that it resembles. The walnut, for instance, has a skull-like protective casing, enclosing the bi-hemispheric meat of its seed, which strikingly resembles the very human brain that it is known to nourish with omega-3 fatty acids and other neuroprotective compounds. In the case of pomegranate fruit, which again, is the ripened ovary – together with its seeds (babies) – from the pomegranate flower, it so perfectly resembles the human ovary in structure (and as we will see, function) that the resemblance is unlikely to be accidental. Could this be Nature revealing her gift of healing in a way that is so obvious that you would have to be blind not to see it? It may demonstrate the intelligent design woven into the co-evolutionary relationship between certain interdependent species; indeed, mammals and angiosperms (which comprise about 250,000 species and include most of the plants that provide the modern world its diet) co-evolved for at least 200 million years together, eventually rising to become dominant life forms on this planet. Pomegranate: An Alternative To Hormone Replacement Therapy? What is perhaps more amazing than the anatomical resemblance of pomegranate to the human ovary, is it functional resemblance. Experiments have been performed revealing that pomegranate contains an estrogen structurally and functionally similar to one found in mammals, namely, estrone,1 and is capable of replacing the function of the ovary when removed from female animals (the ovariectomy-induced postmenopausal experimental model). It is believe that at 17 mg per kilogram pomegranate is the highest known source for estrone in plants. "Administration of pomegranate extract (juice and seed extract) for 2 weeks to ovariectomized mice prevented the loss of uterus weight and shortened the immobility time compared with 5% glucose-dosed mice (control). In addition, ovariectomy-induced decrease of BMD was normalized by administration of the pomegranate extract." Despite the powerful estrogenic properties of pomegranate, this amazing fruit does not exhibit well-known carcinogenic potential associated with synthetic, horse-derived (e.g. Premarin), and even so-called bio-identical or "plant-derived" estrogens. To the contrary, pomegranate has been shown to act selectively to modulate estrogen receptors (SERM) that are beneficial to the organism, while down-regulating activity at the receptors known to be associated with estrogen-sensitive cancers. This type of dynamic intelligence is unique to natural substances, and is not yet reproducible through pharmaceutical preparations. "In conclusion, our findings suggest that PME [Pomegranate extract] displays a SERM profile and may have the potential for prevention of estrogen-dependent breast cancers with beneficial effects in other hormone-dependent tissues." In other words, pomegranate is not only non-carcinogenic but is a powerful anti-cancer agent. The GreenMedInfo database now contains 12 studies on its experimentally-confirmed potential to suppress Breast, Prostate, Colorectal, Gastric and Uterine Cancers. GreenMedInfo also contains research on Pomegranate's therapeutic relevance in 77 disease categories. Hormone replacement, by principle, is capable of feeding the underlying deficiency due to the well-known 'negative feedback loop' within the endocrine system, and may also result in the downstream accumulation of unhealthy levels of hormone metabolites. While it should be regarded as a powerful therapy with significant potential health benefits, it is not without adverse, unintended consequences. The change of life that attends the normal aging process, despite conventional medical classifications, is not a disease. When the burden of hormone production in women shifts away from the ovary (either via age, stress or medical necessity, e.g. full hysterectomy) to the adrenal cortex, the body can be supported to produce additional hormones via basic nutrients and secretagogues, as well through the ingestion of phytocompounds which mimic hormones, e.g. phytoestrogens, but do not have the health risks associated with endogenously produced hormones. Also, it is possible to regenerate steroid hormones that have undergone transformation into inactive or harmful metabolites via electron donors such as vitamin C.
Difficult menopause and perimenopause symptoms can start FAR EARLIER than most women realize (in your twenties) -- even so, and no matter your age, they're NOT "a normal part of aging" like your doctors might say. 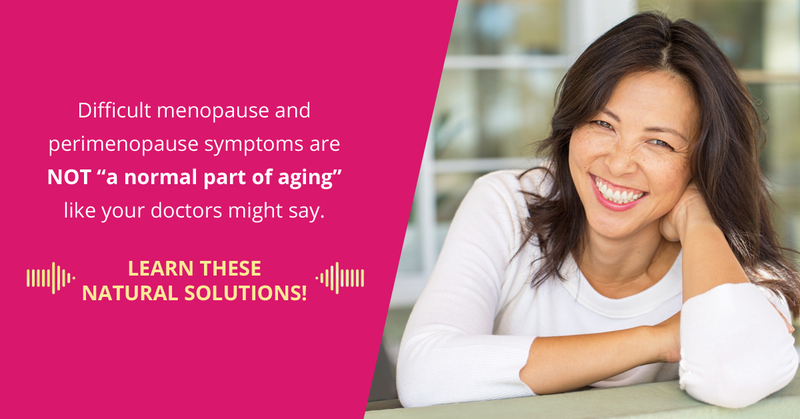 Learn natural solutions at The Perimenopause Summit from March 18-24, 2019, free and online!